This volume assembles translations of the only two prose works of the German authoress Annette von Droste-Hülshoff (1797–1848) published during her lifetime. 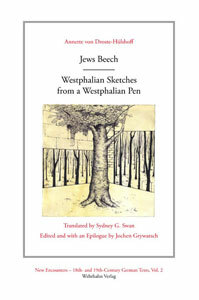 Jews Beech, her most famous work which secured the world-wide reputation, is accompanied by Westphalian Sketches from a Westphalian Pen, which is presented here in English translation for the first time. Jews Beech (1842) with the story around the character of Friedrich Mergel is based on a historically recorded criminal case, that was known to Droste since childhood. With its four enigmatic cases of death Jews Beech is not a (simple) mystery story aiming at the reconstruction of the sequence of events, but a work of art speaking with several voices, and that is what determines its contradictoriness and ambiguity. At the same time, the story is an ethnographic example and a narrative study of region-typical conditions in rural areas around Paderborn/Westphalia. Jews Beech should originally have been a part of a planned but never completed Westphalia novel, as it is also the case with Westphalian Sketches from a Westphalian Pen (1845). This text is set out as a geographic-ethnographic inventory of Westphalia, laid out in a travel format. The reader accompanies the narrator travelling by coach from the Lower Rhine into Münsterland, thence into the Paderborn region, onward into the counties of Corvey and Mark into the Sauerland and finally back into Münsterland. Droste provides social, topological and historical detail of these regions, and even in the 21st century this work could be read much as a travel guide since many features described therein are of a permanent nature – geological formations, hills, types of soil, forests and rivers, locations of settlements and villages.